“Trendy” is a word that would never be used to describe my personal style or anything in my home. I’m not one to follow the latest styles or to concern myself with fashion. I’m sure my teenager thinks I’m completely lame! In my business, however, I often find myself wondering what is “cool” or trying to figure out what the hot colors are going to be for the coming seasons; not because I want to only offer trendy items, but because I want to tap into a different way of generating traffic in my shop. One of my goals has always been to offer a wide range of fabric choices to broaden the appeal of my products. I am currently packing my studio for a cross-country move, so my business will be closed for most of this winter. I honestly have been too busy with daily life to plan for this spring, so I hope to focus on creating a summer line that has some trendy elements once we’re settled. As always, I have grand plans for new bags that might never materialize. Or, maybe I’ll turn into a fashionista before the snow melts…stranger things have happened! You wouldn’t know it from looking at me. I’m incredibly practical in my attire. I have little contact with the outside world and most days my outfits are seen by nobody other than my children. But, I love fashion and trends. I get fashion magazines and can flip through the pages over and over again. I admire the photography, the design of a dress and the colors. Oh the colors! When one grabs my eye, I tear out the page and frantically search my mind for just the right glass to reproduce it. Should it be a floral? Maybe a more graphic design? What should I pair it with? Clothing catalogs get me excited too. The necklines help me visualize the right bead for necklaces. The jewelry helps me determine shapes and designs. Even the shoes can inspire a bead design. I do maintain the right to make what I like. I’m rather classic in my sense of fashion and it does shine through in my bead making. But there is nothing quite like the time I spend with my cup of coffee and a big thick edition of Vogue, to get my creative juices flowing. Fashion and trends have such an influence in our lives. What we wear, what colours we like, what our favourite TV shows are – they are often influenced by what is the ‘flavour of the month’ in the wider world. I guess I am as susceptible to fashion as the next person, but I do not let it dictate my tastes. 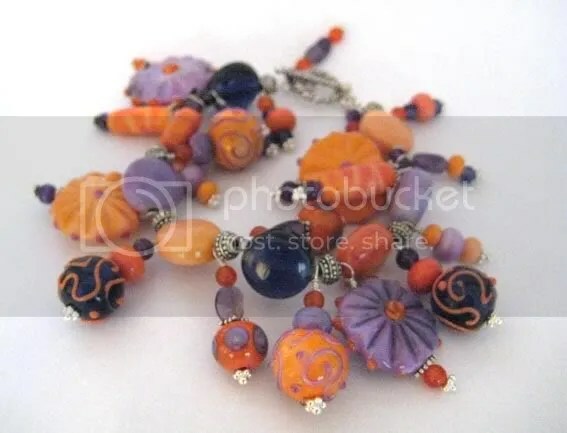 I definitely wont wear a style I dislike, or that isn’t flattering, just because it’s currently in fashion, and likewise, I don’t make beads I don’t enjoy, just because there is a current trend. 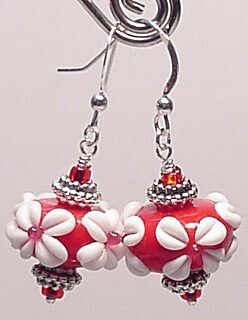 In actual fact, fashion has very little to do with what beads I produce. As the majority of my current customers are in the US, I do sometimes plan bead colours to suit the upcoming American seasons. My beads come from what I feel driven to create, however, so I am rarely influenced by trends and fashions, other than to be aware that the colours I use will suit the season. And not always even that – I make what I like. In beadmaking, you could easily be driven by fashion – not only in choosing designs and colours to suit current clothing fashions, but also by the trends that sweep the beadmaking world. 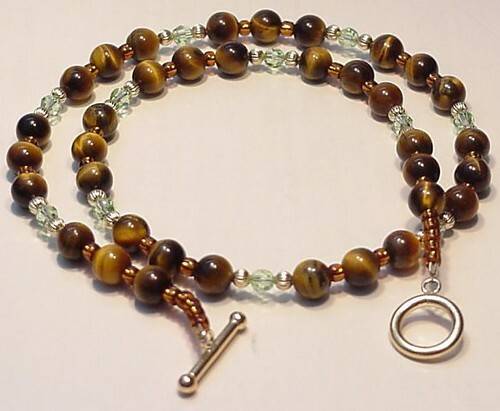 For those of us who frequent the online world of bead forums and auctions, it is often very obvious when a particular technique, glass or style is all the rage. We even see trends in approaches to marketing and selling venues. Despite this, I rarely find myself influenced by the outside world in this way, unless it is to attempt to master a new lampworking technique, or as mentioned, to be aware of the upcoming season of my target audience. But to start a new trend in lampworking, to come up with a design or technique that sweeps the lampworking world – now that may be something all beadmakers would aspire to! Suzanne blogs and torches in her studio in Melbourne, Australia. Spring, summer, autumn and winter, seasons inextricably linked to the fashion world and all that entails. Fashion can be inspiring and sometimes, simply frightening! Basically I am old enough to not follow the trends or fashion. I know what I like and what suits me, which makes shopping a whole lot easier. But we can’t help be guided a little by fashion if only being limited to what we can purchase in colour or cut. As a jewellery designer I can certainly be affected by trends and popular fashion colours or even fashion designs. But as artists and artisans should we be slaves to what the fashion houses declare? For example, a design of high necks or collars would mean my necklaces have to be longer to accommodate going over shirts/tops. They may have to be a little bolder to be noticed. Popular colours can affect my selection of stones a little eg. soft baby pink or hot pink, apricots or creams, icy clear or straw coloured. Trends such as linear or chandelier earrings or chunky necklaces will encourage me to make a few of these and include them in my range for those that are more fashion conscious. Usually I find if I follow trends too closely the jewellery created has limited appeal. It’s important to define your ideal customer when considering your new creations. Luckily, my market is women just like me ! Fashion is, to say the least, a transient thing. Fashions come and go with the times and seasons. Women today are bombarded with choices all clamoring for their attention, and more importantly, their dollar. Women are sometimes referred to as slaves to fashion. A trend is here today and out tomorrow. Some of my girlfriends have closets that are obscenely crammed with articles of clothing and then complain that they have nothing to wear, and off to the mall they go for another round of shopping for the latest style, in the hottest colors. It is like a merry-go-round that never ends until you are either too exhausted or too broke to play the game. I do believe that a woman can go about the game in a way that will not break the bank or dampen her spirits or injure her self esteem. I heard a woman, who was in a position to know what she was talking about, give some great advice that I have never forgotten. Her sage advice was to invest in really top quality basic pieces in very basic colors that are classic in design. I think black is the favored perennial color that lends itself well to the idea of accessorizing these basics with trendy items in the hot colors of the season. Perhaps you could have two very basic black dresses, one in a lightweight fabric that works well in summer, say with short sleeves, and one that will be of a heavier, warmer fabric that can take you thru winter. You would want to choose figure flattering designs that might go a long way toward camouflaging your particular figure flaws and highlighting your great features! Or, you might have a summer palate of basic colors and a winter palate of basic colors. Perhaps in your winter wardrobe, you have blacks, dark blues, and chocolate browns as your basic palate and in summer you choose brighter basics of khaki and white and of course, your basic black is for all seasons. If you choose your basics with great care, you will be able to wear them for years to come. Now it is time to take these basic pieces to the next level! Take for instance the animal print trend! If you had a good basic black dress in your closet that was designed to wear with a belt, you could get yourself a wonderful belt in an animal print and maybe add a fun pair of shoes in a matching animal print and walk out of the house feeling well put together as well as in fashion! Or, what about when HOT pink was all the rage? That same basic black dress would have looked just as great wearing a belt in hot pink, or perhaps you could add a really gorgeous hot pink beaded necklace? Do you see how you can make a basic wardrobe work for you and still keep you in style and be able to keep up with seasonal trends? For me, I love basic black because it covers a multitude of sins. It also provides me with a great opportunity to display my vast collection of jewelry to its best advantage! I also personally prefer to wear dresses most of the time as I find them more comfortable, as well as always acceptable for any occasion when out in public. One of my little tricks is that I have a basic black jumper or two, and I love to find different blouses in assorted colors to change it up. This strategy allows me to maintain a simple closet and relieves me of having to buy so many clothes. Do you have a good strategy to help you keep up with the latest in fashions? Feel free to share your comments! Hmmm…this is a tougher topic to discuss than I imagined. As a jewelry designer whose goal is to sell my work, I have to be aware of seasons and colors and trends to a certain extent. Having local buyers in an area with next to no seasons (Hot and Hotter are not seasons, but half the year it seems! ), I have to push myself to work on Fall and Winter items (it just dipped below 100 degrees here last week) when I’d rather work on summery pieces for another few weeks. I’ve learned that the window is much too small to invest in holiday-themed jewelry designs, other than a few new Christmas colored pieces. But then I also have to remember my website buyers who live in all sorts of climates where they are bundled up a good portion of the year. Where heavier, larger necklaces display on sweaters, and bracelets of substance fight to be seen around long sleeves and gloves. I do find that I am less driven by the “current” trends as dictated by fashion experts unknown to me, and more driven by what I like and how it works with my style of jewelry. “Fashion and trends” go in and out of style, as much to make us think we need to keep up, as anything substantial. I like to think I’m creating pieces that will stand the test of time and trends—to be worn often because the owner is comfortable with her own style, regardless of what the magazines and online sources tell her. And now I’m off to read up on the latest trends to see if I’ve hit the mark or if I’ll have to rely on creating new trends!